November is a big month for WordPress as we should finally see Gutenberg become the default editor. Here at OnTheGoSystems, we have spent October (and many months before that) working hard to make sure we are ready for this change. Not only that, we have also found time to improve and create new features for WPML, Toolset, and ICanLocalize. Here is what we have achieved. We are almost there with Gutenberg compatibility! We have been working on the redesign of the translation workflow and the translation management wizard. Both these main redesigns are aimed at simplifying the user’s experience. While working on this, we also released WPML 4.0.8 and fixed many reported issues. We have also decided to include a new feature in WooCommerce Multilingual to allow different payment gateway settings per currency. This feature can be used for different reasons. For instance, it can be used to define different PayPal accounts per currency and avoid exchange fees. Some things will change once Gutenberg is officially merged into WordPress and we will address these as soon as we spot an issue. In any case, the next version of WPML (4.1.0) will include all the Gutenberg-compatible work so that we can have it ready before WordPress 5.0 is released (scheduled for November 19, 2018). We will have this announced as part of WPML 4.2 – coming soon. Don’t miss our video about ATE and how it works. In October, the Toolset team focused on two main tasks—fixing small bugs and improving usability—and we continued with some of the big projects we have on our hands. Some of our plugins will soon get minor updates after completing rounds of review to improve few of the recently released new features. We are extending the way you work with Types relationships, intermediary post-types, and repeatable groups. We are also solving long-awaiting issues with Forms and Layouts. And Module Manager has recently seen lots of usability improvements and changes to make it even more useful with demo content. On the other hand, we did not forget about extending our features pool. We are finishing a new and shiny drag-and-drop editor for Forms, and Maps is completing a QA round to release a new version with better tools for working with distances. We are also finishing a round of reviews on integrations with third parties. Besides our continued work with page builders, we are ironing the final details to make sure that the Toolset experience in the Gutenberg era is as smooth as it should be. Follow all the latest news on our Toolset Blog. 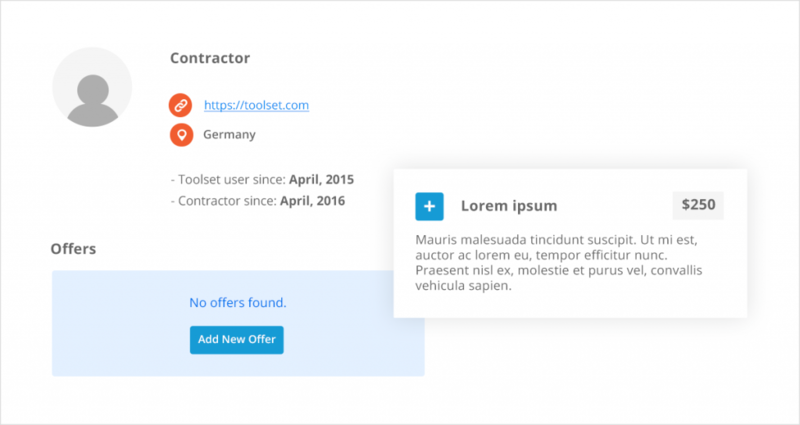 This month has seen the Contractor offers included in the Support Forum search, so that now when a client performs a search on the main forum page, they will also see offers from relevant contractors. Our contractors benefit because they will be visible to more customers, while our clients are happier because their issues related to using and customizing the Toolset or WPML plugins will be resolved quickly by allowing to contact contractors directly. Also, this month we have continued with the development of the Chat Support and performed an in-house test on this. Test results were positive and also provided valuable insights and improvement suggestions that we are taking into account for the next development stage. We also carried out improvements to the checkout process by helping clients for whom the checkout failed due to a diversified range of issues. We are now presenting meaningful error responses and encouragements to ensure successful purchases. We have rewritten, from scratch, the outdated support workflows from the minute a client reports an issue until it is resolved or passed onto the development teams. This change will make the first reply we provide clients much faster and, as a result, we will need to scale up the support group. We are working on that now by training supporters in advanced PHP debugging and compatibility issues. Some more related internal changes are also on the way. We are running a test with a new tool for deploying client’s sites, which is planned to save time and reduce complications for all of us in the technical teams. With this tool, clients will be able to easily provide a fast working duplicated site for us to test on a shared cloud server we set up for them. This will save time by reducing the time used on local servers and with upload/download times. For support, we are also aggressively recruiting more supporters to meet the need to provide the best and fastest support possible for our clients. We need to make sure our current clients are happy with our service and will choose to stay with us when they need to update their license. In the Compatibility team, we are focused on collaboration with major players in the WordPress market. We have started a plan (together with the Marketing team) to offer our products at a discounted price with some of the players with whom we have years of cooperation. On top of that, we continue adding Codeception tests to all major compatible items. In October, we focused on software projects to improve the workflow especially for ongoing projects which are updated frequently. Projects with thousands of strings or with many translation languages over time tended to take longer to load when more content was added. The loading time might become an annoyance especially for older projects used to manage multiple files with ongoing updates. We worked on the system functions and performance to decrease the loading time of the software projects pages significantly so you can work in a faster environment without losing precious time. When you upload new strings and send them for translation, the system calculates an automatic deadline that depends on the number of words to translate. We updated the deadline calculations to be more accurate according to the average translators’ capacity per day, and we also take into consideration the time needed for the review, if you decide to use the optional proofreading service. We also introduced new automatic notifications for translators. When a deadline is approaching, the translators will receive, by email, a reminder to complete the work on time. ICanLocalize stores all your string translations so you can reuse them in other projects to save time and money. When you create a new software project, in the Project tools section you have the option to find existing translations in previous projects. We added a new bulk selector per row and column that will allow you to rapidly select a string and all its translations or an entire language. You can decide in just a few clicks which translations you want to reuse and apply to your new project. This is ideal if you prefer to keep everything organized by creating a new project for every new file you need to translate. Just upload the file in a new project and let the system automatically find the existing translations and apply them for you in new projects with the reuse translations function.